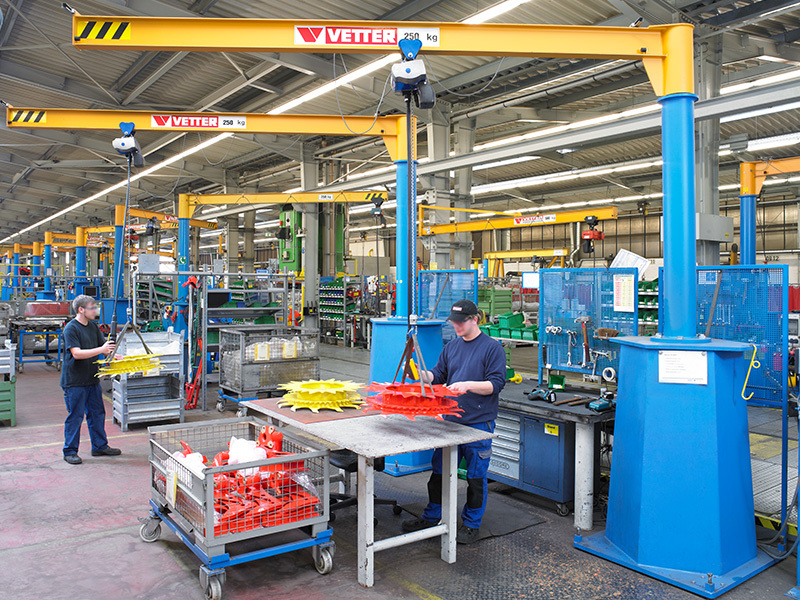 As a reliable partner of the automotive industry and its suppliers, the VETTER Company delivers cranes facilitating in-house logistics and ensuring security of supply while optimizing process chains. 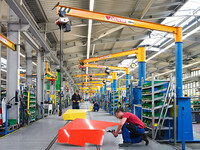 We develop solutions customized to any production process in close conjunction with our customers and partners: Whether mobile crane, workplace crane, or sophisticated PROFI gantry crane intended to link production islands – our experience as a manufacturer of many years guarantees high quality and quick amortisation. The mobile crane MOBILUS is the right choice wherever crane equipment in a production line has to be particularly flexible. 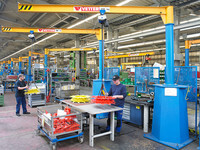 At the Kemper agricultural machinery production location in Stadtlohn/Germany, for example, where more than 30 mobile cranes are already in use. 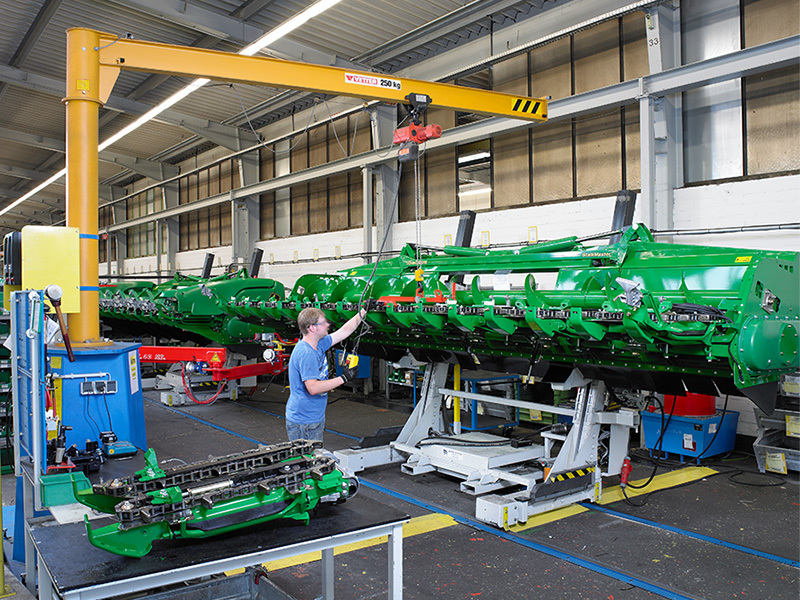 With around 250 employees, the Münsterland-based company Kemper manufactures harvesting attachments for agricultural machinery for global distribution. Since the reorganisation of production in the year 2006, the harvesting attachments have been produced on an assembly line working according to the modern principle of the "Demand Flow Concept". The employees and workstations are so flexible that the different harvesting attachments can be produced in any model mix according to specific orders. 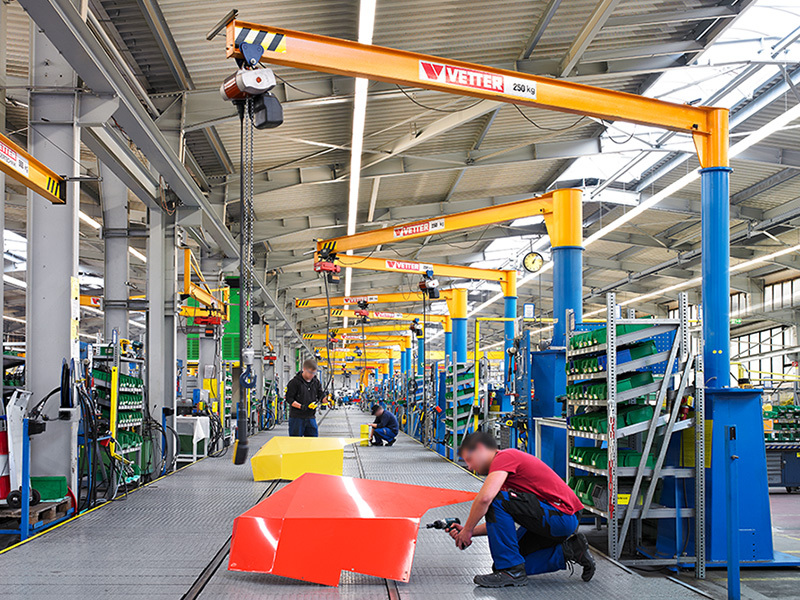 This degree of flexibility is only possible where there is suitable lifting gear available at the workstations, in this case MOBILUS mobile slewing jib cranes from VETTER Krantechnik. Once Kemper had used the first mobile slewing jib cranes from VETTER, the advantages were quickly obvious: the mobile cranes have their foundation integrated in the crane base and can be moved by forklift truck quickly to wherever employees need them. In other words, unlike stationary slewing jib cranes, the crane comes to the workstation and not vice versa. This workstation model has proved so successful, that Kemper now has more than 30 such mobile cranes in operation. They are mainly located at the final assembly line and in the assembly boxes for special devices, but they are also used in the welding cabins. They are principally suitable for almost all workstations in production. Michael Nolte, head of Maintenance at Kemper in Stadtlohn, has been convinced of the efficiency of this method for years: "We have a large number of individual workstations where space requirements are continually changing. This means a flexible and mobile crane which we can move and use somewhere else is the ideal solution for us. The time required for moving the crane is easily regained by the efficient production workflows which are made possible by the cranes' use." The mobile crane MOBILUS is available with capacities of between 125 and 500 kg and an outreach of 2 to 5 m, and can be tailor-made to match customer requirements in terms of hoists. The mobile slewing jib crane can also be delivered with a special trolley under the crane base, allowing the complete crane to be moved without a forklift truck being required.